This column is two still heads in one! 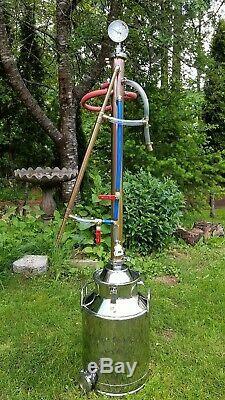 It can be run as a reflux still or a pot still! 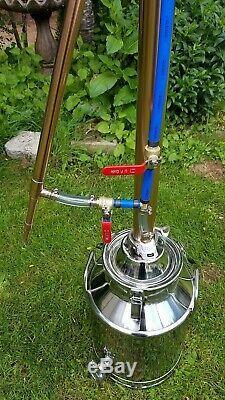 Attaches to a beer keg or 2 commercial distilling kettle. This still will run up to 2 gallons per hour as a pot still (120-140 proof) and. 1 gallon per hour when run as a reflux column (150-180 proof). We have 8 gallon and larger kettles. This unit is a compound still, cooling management design. Cooling water flow is split between two condensers and is fully controllable with the two included valves. This gives the user complete control of the still. It can be run in full reflux mode by allowing full flow to the tower condenser, or you can slow down the cooling water to the tower condenser, and release the product. The liebig condenser then transforms the vapor to a liquid. Adjustments must be made slowly to maintain equilibrium in the column. This is how a high proof is obtained. Other similar stills out there are not true cooling management stills as they dont come with the necessary high quality valves and hoses for full control of the still. This unit is the workhorse of our line of distillers. It has very few parts and is able to distill high proof alcohol quickly. Well built and durable, this still should last many generations. This still will run 2 gallons per hour as a pot still (120-140 proof) and 1 gallon per hour when run as a reflux column (150-180 proof). To run as a pot still run cooling water only to the liebig condenser. Column is 34 inches in length. Made from 2 type L copper pipe. This unit is designed for making ethanol fuel or distilled spirits of up to 90% purity. 34 distiller column & condenser. 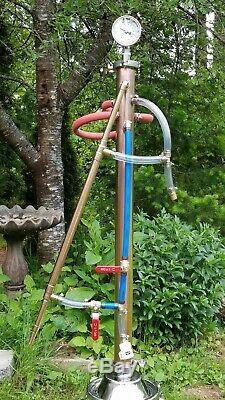 Water flow control kit with brass flow control valve. 2 stainless steel tri-clamps (2), tri-clamp gaskets and o-ring. 1/2 lb of copper mesh packing. Also known as a compound still, this apparatus can make 95% pure ethanol if you have the proper permits or if you live where it is legal to do so. It can also transform seawater or pond-water into fresh, clean, drinking water. It can be used to collect essential oils and make perfumes. It is a great survivalist device to have on hand in case of a major disaster. We use only silver solder with water soluble flux and 56% food grade silver brazing to construct this device. It is built using the same methods that professional distillers use to build their stills. The distiller column is a 2" diameter type L copper pipe that is 34" tall. We do not use cheap thin-walled DWV or type M pipe like our competitors. Three cold-finger condensers at the top of the column enables this distiller to provide up to 100% reflux while making the purest ethanol fuel. This unit can also be used a a pot still simply by disconnecting the cooling water from the cold-finger condensers. Be wary of other still manufacturers claiming that their distiller is a reflux still. Most of them have a short column. A tall column with a condenser at the top is required for the utmost in purity. If there is no cooling at the top of the column it probably will not provide much more than 20% reflux, therefore it is only a pot still and is not capable of making pure ethanol or pure distilled water. Our still columns and condensers are all made from copper pipe because it conducts heat better than stainless steel. This allows for better control and stability, and improves the outcome of the final distillation in terms of flavor. Copper also reduces bacterial contamination (which is why it is also used for water pipes) and absorbs the sulfur produced during fermentation. Copper has been used to make stills since ancient times, and as successive generations have found, it remains the best option thanks to its unique properties and natural advantages in the distilling process. For superior results, use copper like the master distillers do. Ommercially mass produced Chinese stills are made from stainless steel only because it is cheaper than copper. Our stills are designed to combine the best of both worlds, the durability and ease of cleaning that a stainless steel kettle has to offer, combined with the natural advantages of a copper column and condenser. The 2 stainless steel ferrule on the bottom of the unit allows the column to be clamped onto any stainless steel beer keg or commercially available kettle. The condenser is fully adjustable and detachable for cleaning and storage. This distiller can be hooked up to a garden hose or a submersible pump, which can be used for a recirculating cooling system if a garden hose is not an option. All of our distillers are 100% guaranteed. This product has been tested for leaks. Hese units are made professionally from high quality materials and will deliver professional results. They are built to last a lifetime and can be passed on to future generations. This product is proudly hand made in the USA. Assembly and cleaning instructions included. Thanks for shopping at Olympic Distillers! Home distillation of alcohol is illegal in the USA and in many other countries. We strongly discourage any unlawful use of this product, and we will not be held responsible for any injuries or damages caused by unlawful use or misuse of this product. In the USA, a Federal permit is required for making ethanol fuel. 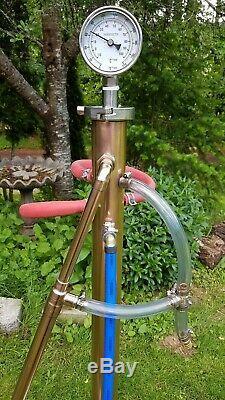 The item "Copper Moonshine Still Fit Beer Keg Water Distiller Reflux Column" is in sale since Wednesday, December 6, 2017. This item is in the category "Home & Garden\Food & Beverages\Beer & Wine Making". The seller is "olympicdistillers" and is located in Port Angeles, Washington.